Allen Ezail Iverson (/ˈaɪvərsən/; born June 7, 1975), nicknamed "The Answer", is an American former professional basketball player. He played for fourteen seasons in the National Basketball Association (NBA) at both the shooting guard and point guard positions. Iverson was an eleven-time NBA All-Star, won the All-Star game MVP award in 2001 and 2005, and was the NBA's Most Valuable Player (MVP) in 2001. He was inducted into the Naismith Memorial Basketball Hall of Fame in 2016. Iverson attended Bethel High School in Hampton, Virginia, and was a dual-sport athlete. He earned the Associated Press High School Player of the Year award in both football and basketball, and won the Division AAA Virginia state championship in both sports. After high school, Iverson played college basketball with the Georgetown Hoyas for two years, where he set the school record for career scoring average (22.9 points per game) and won Big East Defensive Player of the Year awards both years. Following two successful years at Georgetown, Iverson declared eligibility for the 1996 NBA draft, and was selected by the Philadelphia 76ers with the first overall pick. He was named the NBA Rookie of the Year in the 1996–97 season. 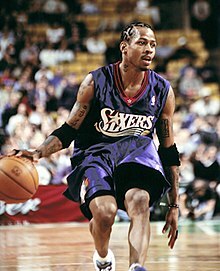 Winning the NBA scoring title during the 1998–99, 2000–01, 2001–02, and 2004–05 seasons, Iverson was one of the most prolific scorers in NBA history, despite his relatively small stature (listed at 6 feet, 0 inches). His regular season career scoring average of 26.7 points per game ranks seventh all-time, and his playoff career scoring average of 29.7 points per game is second only to Michael Jordan. Iverson was also the NBA Most Valuable Player of the 2000–01 season and led his team to the 2001 NBA Finals the same season. Iverson represented the United States at the 2004 Summer Olympics, winning the bronze medal. Allen Iverson was born on June 7, 1975 in Hampton, Virginia to a single 15-year-old mother, Ann Iverson, and was given his mother's maiden name after his father Allen Broughton left her. He grew up in the projects of Hampton, Virginia where drugs and crime were the social norms. During his early childhood years, he was loved by the neighborhood kids and was given the nickname "Bubba Chuck." A childhood friend, Jaime Rogers, said that Iverson would always look out for the younger kids and that "He could teach anybody." At the age of thirteen his father figure in his life, Michael Freeman, was arrested in front of him for dealing drugs. He then failed the eighth grade because of absences and moved to Hampton, Virginia to get out of the projects. He attended Bethel High School, where he started as quarterback for the school football team, while also playing running back, kick returner, and defensive back. He also started at point guard for the school basketball team. During his junior year, Iverson was able to lead both teams to Virginia state championships, as well as earning The Associated Press High School Player of the Year award in both sports. Iverson played for the Boo Williams AAU basketball team and won the 1992 17-and-under AAU national championship. For me to be in a bowling alley where everybody in the whole place know who I am and be crackin' people upside the head with chairs and think nothin' gonna happen? That's crazy! And what kind of a man would I be to hit a girl in the head with a damn chair? I rather have 'em say I hit a man with a chair, not no damn woman. They waited eight months to try Iverson as an adult, and the lead detective lied on the stand about telling Iverson "to take pictures" when he went down to the courthouse. The count initially said that Iverson maimed three people which is usually a sixty-year sentence. Iverson drew a 15-year prison sentence, with 10 years suspended. After Iverson spent four months at Newport News City Farm, a correctional facility in Newport News, he was granted clemency by Virginia Governor Douglas Wilder, and the Virginia Court of Appeals overturned the conviction in 1995 for insufficient evidence. This incident and its impact on the community is explored in the documentary film No Crossover: The Trial of Allen Iverson. "They wanted to make an example out of Iverson," said Iverson's high school basketball coach. "Only defendants not given bond are capital murderers" said James Elleson, Iverson's lawyer. Tom Brockaw and the public played a huge role in the release of Iverson. There were rallies and marches for all four black men that were incarcerated, and Tom Brockaw did a special interview with Iverson from the jail. In this special, Iverson was very apologetic and somber. Tom Brockaw even said, "I thought the sentence was surprisingly harsh." I had to use the whole jail situation as something positive. Going to jail, someone sees something weak in you, they'll exploit it. I never showed any weakness. I just kept going strong until I came out. The prison sentence forced him to complete his senior year of high school at Richard Milburn High School, a school for at-risk students, instead of competing in sports at Bethel. However, the three years Iverson spent there were enough to convince Georgetown University head coach John Thompson to come out and meet Iverson, and offer him a full scholarship to join the Georgetown Hoyas basketball team. In his first season at Georgetown in 1994–95, Iverson won the Big East Rookie of the Year award and was named to the All Rookie Tournament First Team. That season, Iverson led the Hoyas to the Sweet 16 round of the NCAA tournament, where they lost to North Carolina. In his second and final season at Georgetown in 1995–96, Iverson led the team to a Big East championship and all the way to the Elite 8 round of the NCAA tournament, where they lost to Massachusetts. He ended his college career as the Hoyas' all-time leader in career scoring average, at 22.9 points per game. Iverson was named as a First Team All American. Following the conclusion of his sophomore year, Iverson declared for the 1996 NBA draft. He was the first player under Coach Thompson to leave Georgetown early for the NBA. After two seasons at Georgetown, Iverson was selected first overall by the Philadelphia 76ers in the 1996 NBA draft. Listed at 6 ft 0 in (1.83 m) tall, he became the shortest first overall pick ever, in a league normally dominated by taller players. Coming to a Philadelphia team that had just finished the previous season with a dismal 18-64 record, Iverson was only able to help the Sixers to a 22–60 record in 1996–97. In a game against the 55-8 Chicago Bulls, Iverson scored 37 points and memorably crossed over Michael Jordan. He broke Wilt Chamberlain's rookie record of three straight games with at least 40 points, doing so in five straight games, including a 50-point effort in Cleveland against the Cavaliers. Averaging 23.5 points per game, 7.5 assists per game and 2.1 steals per game for the season, Iverson was named the NBA Rookie of the Year. Aided by the arrivals of Theo Ratliff, Eric Snow, Aaron McKie, and new coach Larry Brown, Iverson continued to help the 76ers move forward the following season, as they improved nine games to finish 31-51. The lockout-shortened 1998–1999 season would mark great improvement for the 76ers. Iverson averaged 26.8 points (which led the league, earning his first scoring title) and was named to his first All NBA first team. The Sixers finished the season at 28-22, earning Iverson his first trip to the playoffs. He started all ten playoff games and averaged 28.5 points per game despite being hampered by a number of nagging injuries. Iverson led the Sixers to an upset over the number three seeded Orlando Magic in four games, before losing to the Indiana Pacers in the second round in six games. Prior to the next season, Iverson signed a six-year, $70 million contract extension. That year, the Sixers would continue to improve under Iverson's leadership, as they finished 49-33, once again qualifying for the playoffs (this time earning the fifth seed, one spot higher than the previous year's sixth seed). In the playoffs, Iverson averaged 26.2 points, 4.8 assists, 4 rebounds and 1.3 steals per game. Philadelphia would advance past the Charlotte Hornets in the opening round, but was eliminated by Indiana in the second round in six games for the second straight year. That season, Iverson was selected to the Eastern Conference All-Star team for the first time of what would be 11 straight selections. He was the only player other than Shaquille O'Neal to receive a MVP vote that year. In the 2000 off-season, the 76ers actively tried to trade Iverson after his numerous disagreements with then-coach Larry Brown, and had agreed to terms with the Detroit Pistons before Matt Geiger, who was included in the deal, refused to forfeit his $5 million trade kicker. During the 2000–01 season, Iverson led his team to a franchise record 10-0 start to the season, and was named starter at the 2001 NBA All-Star Game, where he won the game MVP. The Sixers posted a 56–26 record on the year, the best in the Eastern Conference that season, earning the top seed. He also averaged a then-career high 31.1 points, winning his second NBA scoring title in the process. Iverson won the NBA steals title at 2.5 a game. Iverson was named NBA Most Valuable Player; at 6 feet and 165 pounds, he became the shortest and lightest player to win the MVP award. He had 93 first-place votes out of a possible 124. He was also named to the All NBA First team for his accomplishments. In the playoffs, Iverson and the Sixers defeated the Indiana Pacers in the first round, before meeting Vince Carter-led Toronto Raptors in the Eastern Semifinals. The series went the full seven games. In the next round, the Sixers defeated the Milwaukee Bucks, also in seven games, to advance to the 2001 NBA Finals against the defending champion Los Angeles Lakers, featuring the duo of Kobe Bryant and Shaquille O'Neal. Iverson led the Sixers to their first finals since their 1983 championship. In game one of the 2001 NBA Finals, Iverson scored a playoff high 48 points and beat the heavily favored Lakers 107–101; it was the Lakers' only playoff loss that year. In the game, he notably stepped over Tyronn Lue after hitting a crucial shot. Iverson would go on to score 23, 35, 35, and 37 in games 2–5, all losing efforts though the Sixers were not swept like many predicted. 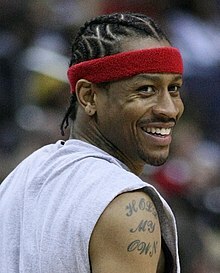 Iverson enjoyed his most successful season as an individual and as a member of the Sixers during the 2000–01 NBA season. Iverson began using a basketball sleeve during this season during his recovery from bursitis in his right elbow. Other players, including Carmelo Anthony, and Kobe Bryant, adopted the sleeves as well, as did fans who wore the sleeve as a fashion statement. Iverson continued wearing his sleeve long after his elbow had healed. Some believed that the sleeve improved Iverson's shooting ability. Steven Kotler of Psychology Today suggested that such sleeves may act as a placebo to prevent future injuries. Fresh off their trip to the NBA Finals, Iverson and the Sixers entered the 2001–2002 season with high expectations, but were plagued by injuries, and only able to muster a 43-39 record to just sneak into the playoffs. Despite playing in only 60 games that season and being hampered by injuries, Iverson averaged 31.4 points per game to earn his second consecutive scoring title. The 76ers lost to the Boston Celtics in the first round of the playoffs 3-2 in the five game series. After the defeat, Brown criticized Iverson for missing team practices. Iverson responded by saying, "We're sitting here, I'm supposed to be the franchise player, and we're in here talking about practice," and went on a rant that included the word "practice" fourteen times. The 2002–2003 season started off poorly for the Sixers, who had just traded defensive-standout Dikembe Mutombo to New Jersey, and saw a decrease in both offensive and defensive production from Aaron McKie and Eric Snow, all three of whom were key components to their Finals appearance two years prior. Iverson would once again put up stellar scoring numbers (27.6 points per game) however, and the Sixers regrouped following the All-Star break to make the playoffs with a 48-34 record. They were able to defeat Baron Davis and the New Orleans Hornets in the opening round of the playoffs. Iverson later described Davis as the most difficult opposing point guard to defend in his career. In the six-game second round series, the 76ers were eliminated by the Detroit Pistons. Head Coach Larry Brown left the 76ers in 2003, following the playoff loss. After his departure from the 76ers, both he and Iverson indicated that the two were on good terms and genuinely fond of one another. Iverson later reunited with Brown when Iverson became the co-captain of the 2004 United States Olympic men's basketball team. In 2005, Iverson said that Brown was without a doubt "the best coach in the world". Randy Ayers became the next coach of the 76ers, but failed to develop any chemistry with his players, and was fired following a 21–31 start to the season. 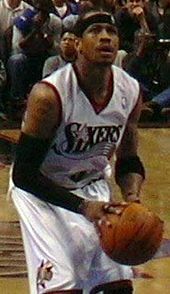 During the latter part of the 2003–04 NBA season, Iverson bristled under the disciplinarian approach of the Sixers' interim head coach Chris Ford. This led to a number of contentious incidents, including Iverson being suspended for missing practice, fined for failing to notify Ford that he would not attend a game because he was sick, and refusing to play in a game because he felt "insulted" that Ford wanted Iverson to come off the bench as he worked his way back from an injury. Iverson missed a then-career-high 34 games in a disastrous season that saw the Sixers miss the postseason for the first time since the 1997 season. The 2004–2005 season saw Iverson and the Sixers bounce back under the tutelage of new head coach Jim O'Brien, and additions of their first round draft pick Andre Iguodala, and All-Star forward Chris Webber, who was acquired in a mid-season trade. A rejuvenated Iverson won his fourth NBA scoring title with 31 points and averaged 8 assists for the year, and helped the 76ers climb back into the postseason with a 43-39 record. They would go on to lose to the eventual Eastern Conference champion Detroit Pistons, who were led by Larry Brown, in the first round. In the series, Iverson had three double-doubles, including a 37-point, 15 assist performance in Philadelphia's lone win of the series. Despite O'Brien helping the team back into the postseason, disagreements with players and management led to his firing after just one season. He was replaced by Sixers' legend Maurice Cheeks, in a personnel move Iverson praised, as Cheeks had been an assistant coach with the team when they reached the NBA Finals in 2001. During the 2005–2006 season, Iverson averaged a career high 33.0 points per game. The Sixers, however, missed the playoffs for the second time in three years. Iverson and the Sixers began the 2006–07 NBA season at 3-0 before stumbling out to a 5-10 record through 15 games. Following the disappointing start, Iverson reportedly demanded a trade from the Sixers (which he deny). As a result, Iverson was told he would not play in any more games. During the following game against the Washington Wizards, which was televised nationally on ESPN, Sixers Chairman Ed Snider confirmed the trade rumors by stating "We're going to trade him. At a certain point, you have to come to grips with the fact that it's not working. He wants out and we're ready to accommodate him." Iverson ended his 10-year Philadelphia tenure with the highest scoring average in team history (28.1), and is second all-time on the points list (19,583), and the Sixers did not win another playoff series after his departure until 2012. On December 19, 2006, the Philadelphia 76ers sent Iverson and forward Ivan McFarlin to the Denver Nuggets for Andre Miller, Joe Smith, and two first-round picks in the 2007 NBA draft. At the time of the trade, Iverson was the NBA's number two leading scorer with new teammate Carmelo Anthony being number one. 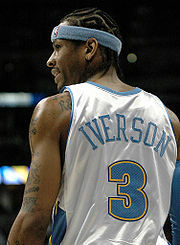 On December 23, 2006, Iverson played his first game for the Nuggets. He had 22 points and 10 assists in a losing effort to the Sacramento Kings. In his first year as a Nugget they made the playoffs. They won the first game and lost the next four to the San Antonio Spurs. Iverson was fined $25,000 by the NBA for criticizing referee Steve Javie following a game between the Nuggets and Iverson's former team, the Philadelphia 76ers, played January 2, 2007. During the game, he committed two technical fouls and was ejected from the game. After the game, Iverson said, "I thought I got fouled on that play, and I said I thought that he was calling the game personal I should have known that I couldn't say anything anyway. It's been something personal with me and him since I got in the league. This was just the perfect game for him to try and make me look bad." Former referee Tim Donaghy supported the claim that Javie had a longstanding hatred for Iverson in his book, Personal Foul: A First-Person Account of the Scandal that Rocked the NBA, which a Florida business group published through a self-publishing arm of Amazon.com after it was dropped by a division of Random House, who cited liability issues after reviewing the manuscript. In a December 2009 interview with 60 Minutes, Donaghy said he and fellow referees thought the punishment was too light. Before Iverson's Nuggets played the Utah Jazz on January 6, 2007, Donaghy said he and the two other officials working the game agreed not to give Iverson favorable calls as a way to "teach him a lesson." Iverson attempted 12 free throws, more than any other player on either team. On 12 drives to the basket, he drew five fouls, three of which Donaghy whistled himself, and did not receive a call on one play in which Utah's Mehmet Okur clearly fouled him. On November 3, 2008, Iverson was dealt from the Denver Nuggets to the Detroit Pistons for guard Chauncey Billups, forward Antonio McDyess and center Cheikh Samb. Iverson, who had worn a #3 jersey his entire NBA career, switched to number 1 for the Pistons, which Billups previously wore for the team. Iverson scored at least 24 in four of his first five games with Detroit (They won 3 of the 5), and would score 20 or more and 6 or more assists on a consistent basis, but as the season wore on, he would lose playing time to Rodney Stuckey. Some have speculated that Pistons President of Basketball Operations Joe Dumars did not envision a long-term role for Iverson on the team, but traded for him to make Stuckey the point guard of the future and free cap space with Iverson's expiring contract. On April 3, 2009, it was announced that Iverson would not play the remainder of the 2008–09 season. Dumars cited Iverson's ongoing back injury as the reason for his deactivation, although two days prior Iverson stated publicly that he'd rather retire than be moved to the bench as Pistons coach Michael Curry had decided. On September 10, 2009, Iverson signed a one-year contract with the Memphis Grizzlies. He stated that "God chose Memphis as the place that I will continue my career," and that "I feel that they are committed to developing a winner." However, Iverson again expressed his displeasure at being a bench player, and left the team on November 7, 2009 for "personal reasons." On November 16, the Grizzlies announced the team terminated his contract by "mutual agreement." He played three games for the Grizzlies, averaging 12.3 ppg, 1.3 rpg, and 3.7 apg in 22.3 mpg. On November 25, 2009, analyst Stephen A. Smith published on his blog a statement attributed to Iverson announcing plans for retirement, which also said, "I feel strongly that I can still compete at the highest level." Less than a week later on November 30, Iverson and his representatives met with a Philadelphia 76ers delegation about returning to his former team, and accepted a contract offer two days later. General manager Ed Stefanski declined to go into the terms of the agreement, but an unnamed source told the Associated Press that Iverson agreed to a one-year non-guaranteed contract at the league minimum salary. Iverson would receive a prorated portion of the $1.3 million minimum salaries for players with at least 10 years of experience, and the contract would become guaranteed for the remainder of the 2009–10 season if he remained on the roster on January 8, 2010. Stefanski said the team made the decision to pursue Iverson after starting guard Louis Williams suffered a broken jaw and was expected to miss at least 30 games. On December 7, 2009, Iverson made his return to Philadelphia, garnering a thunderous ovation from the sold-out crowd, in a loss against his former team, the Denver Nuggets. He finished the game with 11 points, 6 assists, 5 rebounds, a steal, and no turnovers. Iverson's first win in his return to Philadelphia came one week later, in a 20-point effort against the Golden State Warriors, ending the Sixers' 12-game losing streak (which stood at 9 games before Iverson returned). He shot 70 percent from the field in the game. On January 3, 2010, he returned to Denver to face the Nuggets; Iverson scored 17 points and had seven assists in the 108-105 win. He was voted as a starter for the All-Star Game for the 11th straight season. He scored a season-high 23 points (on 56% shooting from the field) in a 99-91 loss to Kobe Bryant and the defending champion Lakers. On February 22, 2010, Iverson left the 76ers indefinitely, citing the need to attend to his 4-year-old daughter Messiah's health issues, which he revealed years later as Kawasaki Disease. On March 2, Ed Stefanski announced Iverson would not return to the 76ers for the rest of the season to deal with the personal matter. His final NBA game was a loss against Derrick Rose and the Chicago Bulls on February 20, 2010. On October 26, 2010, Yahoo! Sports reported that Iverson agreed in principle to a two-year, $4 million net income contract with Beşiktaş, a Turkish Super League team competing in the second-tier level of pan-European professional basketball, the EuroCup (the competition below the EuroLeague level). The club announced the signing at a press conference in New York City, on October 29, 2010. Wearing jersey #4, Iverson made his debut for Beşiktaş on November 16, 2010, in a EuroCup 91-94 loss to Serbian side Hemofarm. Iverson scored 15 points in 23 minutes. Iverson returned to the United States in January 2011 for calf surgery. He only played ten games for Beşiktaş that season, and did not play professional basketball after that. In January 2013, Iverson received an offer to play for the Texas Legends of the NBA D-League, but he declined. On October 30, 2013, Iverson announced his retirement from basketball, citing he'd lost his desire to play. At the 76ers 2013–14 season home opener that night, he received a standing ovation at the beginning of the second quarter. The retirement ceremony was attended by former Georgetown coach John Thompson and Sixers great Julius Erving. Iverson said he would always be a Sixer "until I die," and that while he always thought the day he retired would be a "tough" day, he instead stated it was rather a "happy" day. In November 2013, the 76ers announced that they would officially retire Iverson's number 3 in a special halftime ceremony on March 1, 2014, when the Sixers hosted the Washington Wizards. The ceremony took place in front of 20,000 spectators and 76ers greats such as Julius Erving, Moses Malone, and former team president Pat Croce. In 2017, the creation of the 3-on-3 professional basketball league BIG3 was announced, with Iverson set to be a player and coach on 3's Company. In March, it was announced that Iverson's co-captain would be DerMarr Johnson. 3's Company drafted Andre Owens, Mike Sweetney, and Ruben Patterson during the 2017 BIG3 Draft. On June 25, 3's Company played its first game of the inaugural BIG3 season against the Ball Hogs. In the game, Iverson scored 2 points on 1-for-6 shooting in 9 minutes of play. On only playing 9 minutes, Iverson stated, "I signed up to be a coach, player and captain. Coach part is going to go on throughout the game. Playing part is not going to be what you expect. You're not going to see the Allen Iverson of old out there." Allen Iverson was a very controversial player. [according to whom?] He fueled the merging of the hip-hop and rap culture and the National Basketball Association. Jalen Rose, who played at the same time as Iverson, even said that Iverson is a "cultural icon." "Iverson was the bridge that combined hip-hop and basketball," said NBA star, Dwayne Wade. Iverson came into the league and immediately started making a cultural impact with his cornrows, twenty-one tattoos, and baggy clothing. He wore earrings, a headband, and street clothing to press conferences which was unheard of in the early 2000s NBA. He earned local supports from the global Hip-Hop crowd including celebrities like Scoop Jackson. However, fans of fundamental basketball had a problem with the way Iverson dressed and carried himself. He was called out for having an "ungentlemanly attitude" and "the attitude of a thug". However, given the backlash, Iverson didn't shy away from his identity. Other superstars such as Kobe Bryant, Kevin Garnett, and Carmelo Anthony followed along and started to copy Iverson's style. It even got to the point where then NBA Commissioner, David Stern, issued a dress code for all players that included no headbands, chains and called for business attire only. However, Iverson's impact could not be undone, and he is responsible for allowing players of today's NBA express themselves the way they want. Iverson was a member of the USA World University Games Team in Japan in 1995, that included future NBA stars Ray Allen and Tim Duncan, among others. Iverson led all USA players in scoring, assists, and steals, averaging 16.7 points per game, 6.1 assists per game, and 2.9 steals per game. He helped lead the team to an undefeated record en route to a 141-81 victory over the host country, Japan, for the gold medal. Iverson was selected to be part of Team USA for the 2003 FIBA Americas Olympic Qualifying Tournament in Puerto Rico in August of that year. USA had a perfect 10–0 record, and won the gold medal as well as qualifying for a berth in the 2004 Olympics. Iverson started all eight games that he played in, and was second on the team with 14.3 points per game, while also posting 3.8 assists per game, 2.5 rebounds per game, 1.6 steals per game, and shooting 56.2 percent (41–73 FGs) from the field, 53.6 percent (15–28 3pt FGs) from 3-point and 81.0 percent (17–21 FTs) from the foul line. In the USA's 111–71 victory over Canada on August 25, he accounted for a USA Olympic Qualifying single game record 28 points and made a single game record seven 3-pointers. Playing just 23 minutes, he shot 10-for-13 overall, 7-for-8 from the 3-point line, 1-for-1 from the foul line and added three assists, three steals, and one rebound. All seven of his 3-point field goals were made during the final 7:41 of the third quarter. He finished the tournament ranked overall tied for 10th in scoring, tied for fourth in steals, fifth in 3-point percentage, tied for seventh in assists, and ninth in field goal percentage (.562). Iverson also missed the USA's final two games because of a sprained right thumb which was suffered in the first half of the August 28 Puerto Rico game. In a game against Puerto Rico, he recorded 9 points on 4-for-6 shooting from the field overall, and added five assists and three rebounds in 26 minutes of action in the USA's 101–74 exhibition game victory on August 17 in New York. He was also named to the 2003 USA Senior National Team on April 29, 2003. Iverson and rap star Nelly at a Reebok photoshoot. During the 2000 offseason, Iverson recorded a rap single called "40 Bars". However, after being criticized for its controversial lyrics, he eventually was unable to release it. Going under his moniker, Jewelz, the album was alleged to have made derogatory remarks about homosexuals. After criticism from activist groups and NBA Commissioner David Stern, he agreed to change the lyrics, but ultimately never released the album. On May 14, 2015, Iverson appeared on CBS This Morning in support of a Showtime Network documentary on his life, Iverson, during which he addressed long-discussed rumors of financial struggles, denying any notion that he was struggling. "That's a myth. That's a rumor... The fact that I'm struggling in any part of my life", he said. During the 1997 offseason, Iverson and his friends were stopped by a police officer for speeding late at night. He was arrested for carrying a concealed weapon and for possession of marijuana. He pleaded no contest and was sentenced to community service. In 2002, Iverson was alleged to have thrown wife Tawanna out of their home after a domestic dispute and later threatening two men with a gun while looking for her. All charges against him were later dropped after the judge cited lack of evidence with contradictory statements from witnesses. On February 24, 2004, Iverson urinated in a trash can at Bally's Atlantic City casino and was told by casino management not to return. On December 9, 2005, after the Sixers defeated the Charlotte Bobcats, Iverson paid a late-night visit to the Trump Taj Mahal. After winning a hand at a three-card-stud poker table, Iverson was overpaid $10,000 in chips by a dealer. When the dealer quickly realized the mistake and requested the chips back, Iverson refused, and a heated head-turning argument between him and the casino staff began. Atlantic City casino regulations reportedly state that when a casino makes a payout mistake in favor of the gambler, the gambler must return the money that they did not legitimately win. Also in 2005, Iverson's bodyguard Jason Kane was accused of assaulting a man at a Washington, D. C. nightclub after the man, Marlin Godfrey, refused to leave the club's VIP section so Iverson's entourage could enter. Godfrey suffered a concussion, a ruptured eardrum, a burst blood vessel in his eye, a torn rotator cuff, cuts and bruises, and emotional distress. Although Iverson did not touch Godfrey himself, Godfrey sued Iverson for the injuries caused by his bodyguard. In 2007 a jury awarded Godfrey $260,000. The United States Court of Appeals for the District of Columbia Circuit upheld the verdict in 2009. In August 2011, an Ohio man sued Iverson for $2.5 million in damages, claiming Iverson's security guard assaulted him in a 2009 bar fight in Detroit. The federal judge dismissed the case, finding no evidence that Iverson or his bodyguard struck the plaintiff, Guy Walker. In 2013, Iverson was accused of kidnapping his children and refusing to return them to their mother. He denied the claim and his ex-wife later recanted. In August 2001, Iverson married his high school sweetheart Tawanna Turner at The Mansion on Main Street in Voorhees, New Jersey. They have five children: Tiaura (born 1995), Allen II (born 1998), Isaiah (2003), Messiah (born 2005), and Dream (born 2008). On March 2, 2010, Tawanna Iverson filed for divorce, seeking custody of their children, as well as child support and alimony payments. According to Iverson, the couple were back together less than a month after the divorce was finalized in 2013. Iverson's cousin, Kuran Iverson, played Division I basketball for the University of Rhode Island and now plays in the NBA G-League. ^ Cronin, Brian (September 12, 2012). "Was Allen Iverson once sued over his 'The Answer' nickname?". Los Angeles Times. ISSN 0458-3035. Retrieved April 23, 2018. ^ LYNN BURKE 247-4961 September 24, 2004 (September 24, 2004). "3. Allen Iverson". dailypress.com. Retrieved August 4, 2012. ^ a b "Allen Iverson". Georgetown Basketball History. December 3, 2010. Retrieved November 19, 2011. ^ "Special Dime: Greatest shooting guards of all time". ESPN. March 11, 2008. Archived from the original on March 14, 2008. ^ 2009-10 Memphis Grizzlies media guide Archived November 9, 2012, at the Wayback Machine, p. 22. ^ "A Town Divided: Allen Iverson And Hampton, Va". National Public Radio. April 13, 2010. ^ a b "Iverson | Netflix". www.netflix.com. Retrieved November 2, 2018. ^ Nance, Roscoe (February 22, 2004). "Iverson puts heart on line, ignores injuries". USA Today. Retrieved December 22, 2008. ^ "Allen Iverson at Bethel". dailypress.com.com. Retrieved September 24, 2004. ^ Latimer, Clay (December 20, 2006). "He brings baggage but also a big heart". Rocky Mountain News. Retrieved December 22, 2008. ^ TEEL, DAVID (July 26, 1992). "AREA STARS EARN NATIONAL AAU TITLE". dailypress.com. Retrieved February 2, 2019. ^ Teel, David; Chernicky, David (February 24, 1993). "Feb. 24, 1993: Iverson still for Bethel playing despite his arrest". Daily Press. Newport News, Virginia: Tribune Media. Retrieved August 31, 2013. ^ a b c d e f g Sielski, Mike (March 4, 2007). "Iverson Answers the Call". ESPN.com. Archived from the original on July 24, 2010. Retrieved December 22, 2008. ^ Check Out These Stories from Our Partners (December 10, 2009). "Allen Iverson Rewind: Georgetown University". The Hoop Doctors. Archived from the original on December 30, 2010. Retrieved December 29, 2010. ^ "1994-95 Georgetown Hoyas Roster and Statistics | College Basketball at". Sports-reference.com. Retrieved August 4, 2012. ^ "1995-96 Georgetown Hoyas Roster and Statistics | College Basketball at". Sports-reference.com. Retrieved August 4, 2012. ^ "1996-97 Philadelphia 76ers Roster and Statistics". Basketball-Reference.com. Retrieved August 4, 2012. ^ "Bulls vs. 76ers - Box Score - March 12, 1997 - ESPN". Retrieved March 5, 2017. ^ "Archives - Philly.com". Retrieved March 5, 2017. ^ "Allen Iverson Scores 40 in Five Straight Philly Sports History". Retrieved March 5, 2017. ^ "1997-98 Philadelphia 76ers Roster and Statistics". Basketball-Reference.com. Retrieved August 4, 2012. ^ "1998-99 Philadelphia 76ers Roster and Statistics". Basketball-Reference.com. Retrieved August 4, 2012. ^ "1999 NBA Playoffs Summary". Basketball-Reference.com. Retrieved August 4, 2012. ^ "Allen Iverson timeline". ESPN. December 20, 2006. Retrieved December 29, 2010. ^ "1999-00 Philadelphia 76ers Roster and Statistics". Basketball-Reference.com. Retrieved August 4, 2012. ^ "2000 NBA Playoffs Summary". Basketball-Reference.com. Retrieved August 4, 2012. ^ Smallwood, Jr., John (March 2001). "Brotherly Love Like – Allen Iverson, under the coaching of Larry Brown, emerges as team captain of the Philadelphia Seventy-Sixers". Basketball Digest. Archived from the original on March 30, 2005. ^ CBS Sports. "Six-foot Iverson smallest player to win MVP award [permanent dead link]". CBS Sports. May 15, 2001. Retrieved on December 31, 2008. ^ "NBA Finals 2001". NBA.com. Retrieved December 29, 2010. ^ a b c Steven Kotler. "Allen Iverson, Kobe Bryant and Basketball's Placebo effect[dead link]". Psychology Today. April 17, 2008. Retrieved on January 8, 2009. ^ "2001-02 Philadelphia 76ers Roster and Statistics". Basketball-Reference.com. Retrieved August 4, 2012. ^ "Allen Iverson news conference transcript". CNNSI.com. May 10, 2002. ^ Wood, Skip (May 9, 2002). "Brown puts balm on Iverson's feelings". USAToday.com. ^ "2002-03 Philadelphia 76ers Roster and Statistics". Basketball-Reference.com. Retrieved August 4, 2012. ^ Allen Iverson [@Sixers] (April 15, 2015). "Baron Davis. #AskTheAnswer" (Tweet). Retrieved April 16, 2015 – via Twitter. ^ Andy Friedlander. "Brown's relationship with Iverson? Answer might surprise you". Philly.com. Retrieved March 30, 2013. ^ "Iverson 'insulted' by decision to have him come off bench". USA Today. March 15, 2004. Retrieved April 23, 2010. ^ "2004-05 Philadelphia 76ers Roster and Statistics". Basketball-Reference.com. Retrieved August 4, 2012. ^ Roberts, Kevin (April 19, 2006). "Now's time to get rid of A.I., Webber". courierpostonline.com. Gannett Company. Retrieved August 20, 2014. ^ "Sixers' Iverson to Celtics? It's all just talk". The Boston Globe. June 26, 2006. Archived from the original on June 29, 2006. ^ "Allen Iverson 2006-07 Game Log". Basketball-Reference.com. Retrieved August 4, 2012. ^ "In first interview since trade, Iverson tells his story". ESPN. December 22, 2006. Retrieved December 29, 2010. ^ "Trade talks heat up as Iverson sits two games". ESPN. December 9, 2006. Retrieved December 29, 2010. ^ "Miller, Smith go to Sixers in deal for Iverson". ESPN. December 20, 2006. Retrieved December 29, 2010. ^ Eddie Pells (December 23, 2006). "Iverson Shines in Nuggets Loss to Kings". NBA.com. Retrieved December 29, 2010. ^ "Spurs Close Out Nuggets in Game 5". NBA.com. May 3, 2007. Retrieved December 29, 2010. ^ "Iverson fined $25,000 for postgame rant against Javie". ESPN. January 7, 2007. Retrieved December 29, 2010. ^ Abbot, Henry (December 3, 2009). "Personal Foul: Tim Donaghy's NBA tell-all now available". TrueHoop. ESPN.com. ^ Beck, Howard (October 29, 2009). "Tim Donaghy Again Forces an N.B.A. Investigation of Referees". The New York Times. Retrieved October 29, 2009. ^ Berger, Ken (December 8, 2009). "Disgraced former ref Donaghy details scam on '60 Minutes'". CBS Sports. Archived from the original on May 25, 2012. Retrieved December 8, 2009. ^ "Dalembert tallies winner for Sixers, who stave off Iverson, Nuggets". ESPN. March 19, 2008. Retrieved March 1, 2014. ^ "Pistons Acquire Allen Iverson from Denver in Exchange for Chauncey Billups, Antonio McDyess and Cheikh Samb". ^ "Allen Iverson 2008-09 Game Log". Basketball-Reference.com. Retrieved December 29, 2010. ^ "Ford: Why Dumars made the Iverson trade". November 4, 2008. Retrieved March 5, 2017. ^ "Grizzlies sign four-time scoring champion Allen Iverson". Retrieved December 23, 2014. ^ "God Chose Memphis?". The Washington Post. ^ Spears, Marc J. "Grizzlies, Iverson off to rocky start". Yahoo! Sports. Retrieved December 29, 2010. ^ Spears, Marc J. "Iverson leaves the Grizzlies". Yahoo! Sports. Retrieved December 29, 2010. ^ "Grizzlies part ways with Iverson". The Sports Network. November 16, 2009. Archived from the original on October 12, 2013. Retrieved December 7, 2017. ^ "Report: Iverson to retire". espn.go.com. ESPN. November 27, 2009. Retrieved August 20, 2014. ^ Stein, Marc (December 1, 2009). "Sources: Sixers closer to Answer". ESPN.com. ^ Jasner, Phil (December 3, 2009). "Iverson's humble homecoming". Philadelphia Daily News. ^ Juliano, Joe (December 2, 2006). "Iverson agrees to non-guaranteed deal with Sixers". The Philadelphia Inquirer. ^ "Philadelphia 76ers guard Allen Iverson starts Monday against Denver Nuggets". ESPN. December 7, 2009. Retrieved December 29, 2010. ^ "The Game Happens Here". NBA.com. Retrieved December 29, 2010. ^ "NBA.com/Stats". Retrieved March 5, 2017. ^ "NBA.com - The Game Happens Here". Retrieved March 5, 2017. ^ "SIXERS: Postgame Report - Lakers vs. Sixers - 1/29/2010". Retrieved March 5, 2017. ^ "Iverson out to spend time with daughter". Associated Press. February 22, 2010. Retrieved May 26, 2013. ^ "Iverson officially done with the Sixers". Philadelphia Daily News. March 2, 2010. Archived from the original on March 7, 2010. Retrieved March 3, 2010. ^ "76ers vs. Bulls - Game Recap - February 20, 2010 - ESPN". Retrieved March 5, 2017. ^ "Allen Iverson agrees to two-year deal with Turkish team". Detroit Free Press. October 26, 2010. Archived from the original on October 29, 2010. Retrieved October 26, 2010. ^ "Allen Iverson 'Ecstatic' To Go To Turkey". Associated Press. October 29, 2010. ^ "NBA MVP Iverson arrives in Istanbul to join Turkish team". Xinhua. November 9, 2010. Retrieved September 1, 2013. ^ "Beşiktaş ColaTurka – KK Hemofarm Stada Game Report". Eurocupbasketball.com. November 16, 2010. Retrieved November 16, 2010. ^ Berger, Ken (February 1, 2011). "Iverson out 6-8 weeks after leg procedure". CBS Sports. Archived from the original on November 24, 2011. Retrieved July 16, 2011. ^ Bradley, Ken (January 29, 2013). "Allen Iverson says he won't go D-League route to return to NBA". SportingNews.com. Retrieved August 10, 2013. ^ "Iverson at peace as he retires from basketball". NBA.com. Turner Sports Interactive, Inc. October 30, 2013. Retrieved October 31, 2013. ^ a b "Allen Iverson officially retires". ESPN. October 30, 2013. Retrieved March 1, 2014. ^ "Heat at 76ers". NBA.com. Retrieved December 23, 2014. ^ "Philadelphia 76ers to Officially Retire Allen Iverson's Number "3" on March 1, 2014". Retrieved December 23, 2014. ^ "Sixers Announce Details for Historic Allen Iverson Retirement Ceremony on March 1". Retrieved December 23, 2014. ^ "Wizards at 76ers". NBA.com. Retrieved December 23, 2014. ^ Parco, Nicholas (January 11, 2017). "Ice Cube announces BIG3 basketball league for former NBA stars, will feature Allen Iverson as player and coach". New York Daily News. Retrieved June 26, 2017. ^ @thebig3 (April 30, 2017). "The full #BIG3Draft results are in! Retweet, debate and get excited for the June 25th season opener at @barclayscenter" (Tweet). Retrieved June 26, 2017 – via Twitter. ^ a b Polacek, Scott (June 25, 2017). "'Exciting,' Talks Playing Only 9 Minutes". Bleacher Report. Retrieved June 26, 2017. ^ Conway, Tyler (June 25, 2017). "BIG3 League Basketball 2017 Results: Allen Iverson Struggles in Win". Bleacher Report. Retrieved June 26, 2017. ^ "USAB: EIGHTEENTH WORLD UNIVERSITY GAMES - 1995". Usabasketball.com. September 2, 1995. Archived from the original on December 5, 2010. Retrieved December 29, 2010. ^ "USAB: EIGHTEENTH WORLD UNIVERSITY GAMES - 1995". Usabasketball.com. September 2, 1995. Archived from the original on December 5, 2010. Retrieved August 4, 2012. ^ "Iverson stars as US beats Canada 111-71". Chinadaily.com.cn. Retrieved August 4, 2012. ^ "Misunderstood Allen Iverson Skips Hip-Hop For Hoops – Rhapsody Music Downloads". VH1.com. Archived from the original on April 14, 2009. Retrieved December 29, 2010. ^ "Allen Iverson Addresses Broke Rumors: "That's A Myth"". BallerStatus.com. May 15, 2015. ^ Heath, Thomas (August 27, 1997). "Iverson Receives 3 Years' Probation". Washington Post. ^ "PRO BASKETBALL; Felony Charges Dropped Against Iverson". New York Times. July 30, 2002. ^ a b "NBA Star Allen Iverson and Casino Staff Battle it out in Atlantic City". Archived from the original on May 5, 2006. ^ "Judge dismisses bar-fight lawsuit against Allen Iverson". Associated Press. November 15, 2011. Archived from the original on November 18, 2011. ^ Harper, Zach. "Allen Iverson says he didn't hold kids hostage, returned them to mom". CBSSports.com. Retrieved March 10, 2019. ^ a b "Tawanna Iverson files for divorce". Philadelphia Daily News. March 4, 2010. ^ "Allen Iverson Opens Up About Daughter's Mystery Illness". PEOPLE.com. Retrieved March 10, 2019. ^ Frank, Reuben (April 5, 2016). "Now retired, Allen Iverson 'much more settled' in personal life". NBC Sports Philadelphia. Retrieved March 10, 2019. ^ "Allen Iverson's Cousin Is Grabbing Boards, Turning Heads in College Basketball". Bleacher Report. Retrieved March 10, 2019. ^ "Naismith Memorial Basketball Hall of Fame Class of 2016 Announcement presented by Haggar Clothing Company". Naismith Memorial Basketball Hall of Fame. April 4, 2016. Archived from the original on April 17, 2016. Retrieved April 4, 2016. Wikimedia Commons has media related to Allen Iverson.